Imagine a school where the staff and students designed everything that was in it? The canteen menu, the door signs, banners outside welcoming guests? Hang on a minute………..! The “Proper Business” was soon christened, and my room was taken over every Tuesday evening by eager students designing projects such as “Trophies for champions”, “Make your room bling” and “Shirtz Inc.” (i.e., designing bespoke T-shirts for teams and productions if the slang was misleading!). An official bank account was set up and on one quite depressing afternoon I realised they had more in their current account than I did! Enterprise projects not only give students an idea of how the skills they have learnt in the classroom can be used in the outside world, but they also hit many of the buzz words in education at present. STEM, personalised learning, numeracy, literacy and cross-curricular to name a few. Enterprise can be adapted to challenge the gifted and talented, and also to support and raise the confidence of learners at all levels. 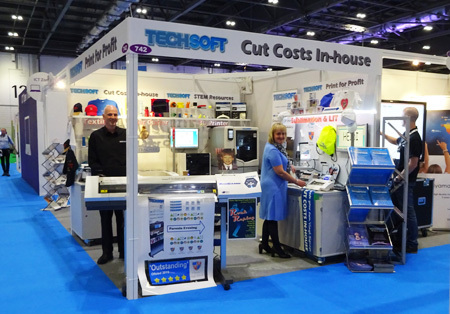 TechSoft have put together a range of Enterprise Packs with this in mind; sublimation, knife-cutting, computerised embroidery, laser cutting and large format printing. Each uses our carefully researched and tested products.  If, however, you don’t want a situation where your students’ “Proper Business” is seemingly making more money than you earn, these are simply a way to reduce in-house costs in school. Practically anything that a school has to order can be made on site with our packs. 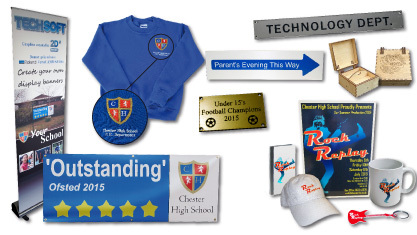 Trophies for awards, banners for signage in school or outside, and even promotional T-shirts for events or departments! You could even take a leaf out of my year 10’s book and take orders from other schools and businesses in the area – turning your reprographics room into a business hub! We at Techsoft think there is nothing better than seeing students work displayed around a school. But if students actually helped to design the school? Putting their personality on it? That would be even better! Why not use the creative pool of staff and students in your school and use our ever popular LaserCAM to manufacture and produce accessories for productions, events and parents’ evenings? Or our “Embroidery Pack” using our impressively professional Brother PR-655E needle machine to rapidly output personalised T-shirts, caps and other promotional accessories for the school production! 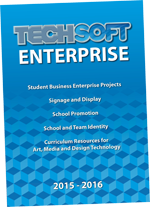 If you’re feeling inspired, a copy of the TechSoft Enterprise Product Guide is available to download from the website www.techsoft.co.uk or by calling us on 01745 535007 or sales@techsoft.co.uk.